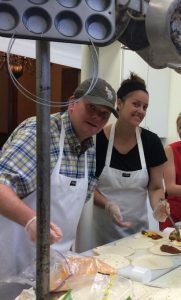 Firm Attorney Lewis Lyons Gives Back to Community - Glassman, Wyatt, Tuttle, and Cox, P. C.
Attorney Lewis Lyons and wife Carly are volunteer cooks at Grace St. Luke’s More than a Meal. Every Sunday volunteers from across the community plan a menu, shop and prepare a well balanced meal for up to 100 guests that may not otherwise have access to a warm meal. Lewis, like other members of Glassman, Wyatt, Tuttle & Cox, PC, strive to give back to the community in a diverse number of ways. You can learn more about the Firm’s commitment to the community on the About The Firm section of this website.